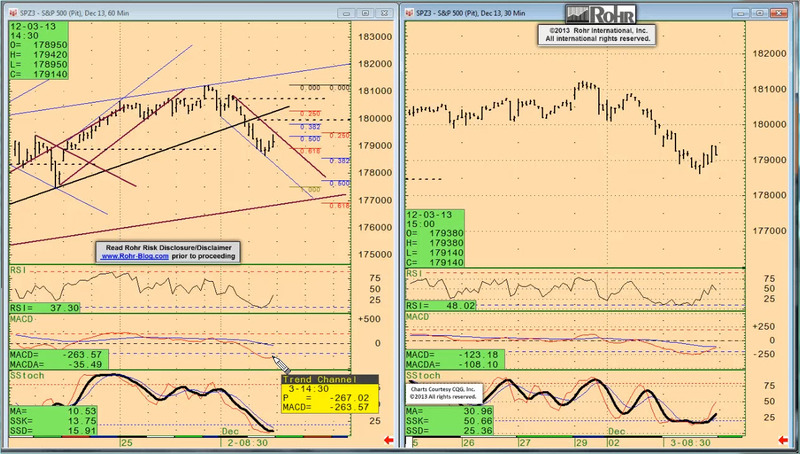 This is an atypical single TrendView Video (http://bit.ly/1azFmJ2), because so much of the trend evolution out of the end of last week into this morning has been very consistent with our views. So we are keeping it short and simple this morning. The timeline opens with the typical discussion of macro (i.e. politico-economic) factors and short-term December S&P 500 future view. That leads to the intermediate-term December S&P 500 future analysis from 03:30, with the other equities from 05:00, govvies analysis beginning at 07:15, and short money forwards from 11:50. The Foreign Exchange section continues with the US Dollar Index at 13:30, and jumping around a bit to best integrate the cross rate analysis with the US dollar relationships prior to a brief return to the December S&P 500 future at 17:40. 2013/10/04: Commentary: Your Government at Work… or NOT!! COMMENTARY: Friday, October 4, 2013. And the number is… ??????? Can’t tell ya. Don’t know. What a way to run a railroad. And here are the wizards in Congress at the switches again, hoping they can time the shift into continuing operations timely… as in before the US government train heads off the cliff again. And as we noted yesterday, while we hope and expect Congress will find a way to pass not just a Continuing Resolution on spending but also the far more critical Debt Ceiling increase timely to avoid an October 17th US government default, with these folks you never know. And the ‘failure is not an option’ crowd is back out in full flower. But as we noted on Tuesday, they also held that view right up to the actual failure back in August 2011. So no real cause for comfort there. A fresh set of Technical Projections and Select Comments are already available via the link in the right hand column. They incorporate the sharp swings from the top of the year response to the US Fiscal Cliff avoidance effort. While that was characterized as a tax hike on ‘the rich’, it is important to note this was only insofar as the income tax rate is concerned. We found the strong initial equities response to the US Employment report bizarre. Could we have been the only ones considering what was, and what was not, counted? There is also the issue of how the US Unemployment Rate got to 7.70% that we will revisit below. But that initial strong equities response was a clear indication of nothing other than the power of headline numbers to move markets regardless of what the full story might be. And as bizarre as it might’ve sounded on the initial release, there is a good reason the Bureau of Labor Statistics could tell us that Super Storm Sandy had little or no impact! Based on the fine line statistical methodology, anyone employed on October 13 was counted as employed after Sandy hit on October 29th. It is indeed accurate because of the reporting period statistical protocols. The November data was drawn from the period between October 13th and November 12th, and any worker who was not off for the entire pay period is counted as employed!! As we noted in the previous post’s mention of this aspect, there is a typically somewhat perverse influence of a major storm like Hurricane Sandy. It is so counterintuitive as to not be as clear cut as most folks would like to think. Anyone except serious market students who have been there before (like Irene and especially Katrina, etc.) are not necessarily prepared to look at all the carnage presented by the media and consider it is anything negative. The only question now is whether this storm is the norm or a new form? And by that we mean the extensive damage (even more so by a major factor than last year’s Hurricane Irene) that is being incurred not just along the entire Northeastern seaboard, but the entire Northeast region. It is one thing for New Orleans and the Mississippi Gulf coast to be slammed by Katrina. Might it be another matter altogether for the highly concentrated Northeast (as well as regions as far west as Pennsylvania and even Ohio) to be shut down for an extended period?